One of the most crucial aspects of modern logistics is the increase in visibility that comes from enhanced digitization across the entire supply chain. Increased visibility is a crucial first step to building a smarter value stream as well as a necessary prerequisite to the kind of transparency and intra-operational collaboration that have the power to make modern logistics so much more efficient and comprehensive than its earlier incarnations. What might begin with a decrease in information silos throughout shipping and freight forwarding operations can easily help pave the way for real time freight and cargo tracking, which would add value for businesses and customers alike by creating additional planning stability. While this notion may seem somewhat farfetched, smart ports like Abu Dhabi’s are already implementing solutions that make possible not just real-time tracking, but real-time viewing of documents and other mission critical information for freight forwarders and their customers. On the topic of smart ports, there are a host of other “smart” versions of traditional logistics components that are changing the way that goods move from suppliers to customers. Smart containers and smart pallets, for instance, are transforming traditional shipping workflows into new opportunities to collect and act on crucial information about whatever stock is being moved. A smart pallet, for instance, could alert users if it were being filled noticeably more or less than its maximum weight capacity, thereby either preventing wear and tear or increasing load-time efficiency. As the logistics industry continues to evolve, the endgame of all of the “smart” components will be an increase in autonomous decision-making in the supply chain comparable to the level of autonomous decision making currently being seen in especially advanced Industry 4.0 environments. While for many this will conjure images of driverless cars and trucks (and of course that technology is arguably getting closer every day), this trend will likely begin on a smaller scale, e.g. with robots that can make inventory restocking decisions on their own, thereby saving time and money. When it comes to smart containers, pallets, vehicles, ports, etc. the question remains: how does one maximize one’s ability to gain meaningful data from various touchpoints along the value chain and turn that data into valuable, integrated insights? In Industry 4.0 environments, this role is being filled by internet of things (IoT) devices deployed carefully on factory floors and in warehouses, and the deployment of IoT devices in logistics workflows is no less crucial. IoT adoption both enables and enhances technology like smart containers, both by connecting them (usually via the cloud) to a company’s existing IT, but also by gaining increasingly specific and granular insights. For instance, some businesses have deployed heat and light sensors in their storage areas to ascertain the likelihood that a particular product might become damaged or destroyed by poor physical conditions. If the sensors determine that this damage is likely to have occurred, they can send alerts back to inventory managers and production planners to ensure that existing production and transport plans are adjusted to allow for the creation and distribution of replacement parts. As alluded to above, this modern logistics paradigm is closely related to Industry 4.0. As such, one of the most important facets of Logistics 4.0 is its ability to integrate seamlessly with Industry 4.0 systems, creating a symbiotic, synergistic relationship between manufacturers and shippers. While the full implications of the relationship between digitized logistics and smart manufacturing remain to be seen, it’s already clear that the benefits of, for instance, increased E2E visibility can be multiplied when logistics operations and manufacturing outfits share data and IT resources. Going forward, this will help to bring about a global supply chain that is leaner, smarter, and more agile—not in a piecemeal fashion, but as a cohesive, interconnected system. Much has been made so far of the importance of collecting data in these new logistics frameworks, but the real value of that data isn't limited to making manual planning efforts more cohesive. Rather, the endgame of advances in transparency, visibility, and data collection through sensors and RFID chips is utilization in advanced analytics processes. By feeding large quantities of information into predictive and prescriptive algorithms, modern logistics providers can improve their demand and shipping forecasts while uncovering potential areas of waste or possible improvement in their value streams. This is helping lay the foundations for a smoother version of supply chain management, one that is less susceptible to risk, disruptions, and opacity, but it’s also paving the way for the rise of anticipatory logistics, i.e. 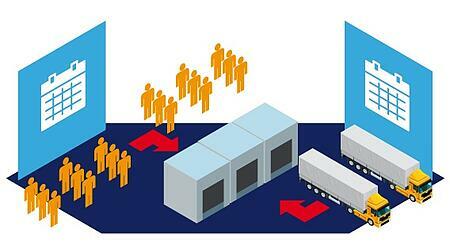 logistics processes that predict and act on customer needs before they arise. Just one of the many new frontiers available to modern, digitized shippers and freight forwarders.